Last night after our dinner I prepared a plate for today's post. It was quite dark to take photos, so I decided to leave the plate in the refrigerator and take another, better photo after sun comes up in the morning. After dropping the teenager at school, I drove back home, thinking of what place in my home is better to take photos this time of the day? Would it be kitchen? Or Living room? Upon my return, I started to prepare the set: props, position of the table (I am gaining muscles moving furniture around for better photos as I don't use any additional lights. More on that in a later posts). When everything was ready I went to the kitchen for the plate... Before I checked refrigerator, with the corner of my eyes I caught the familiar plate in the kitchen sink. "It must be left by someone after the breakfast" - was my innocent thought. Then I opened the refrigerator... My head was turning from refrigerator to the sink in disbelief. I looked at the happy husband, who was sipping his morning coffee and reading the news. "Thanks for the breakfast", - he said. "I love those roasted vegetables. The plate was pretty too. Can you make some more?" I approached my husband, giving him a hug and kissing him in a well groomed cheek, and murmured in his ear: "I wanted to take a picture of that plate, dear..."
LOL! I guess you need to start posting warning signs on your plates until after the photos are taken. :) The stuffed dates look lovely, too. I've not cooked much with dates, but I've found a lot of date recipes in my grandmother's recipe box, so I think it is time to explore. This is one of the popular snack in my house. 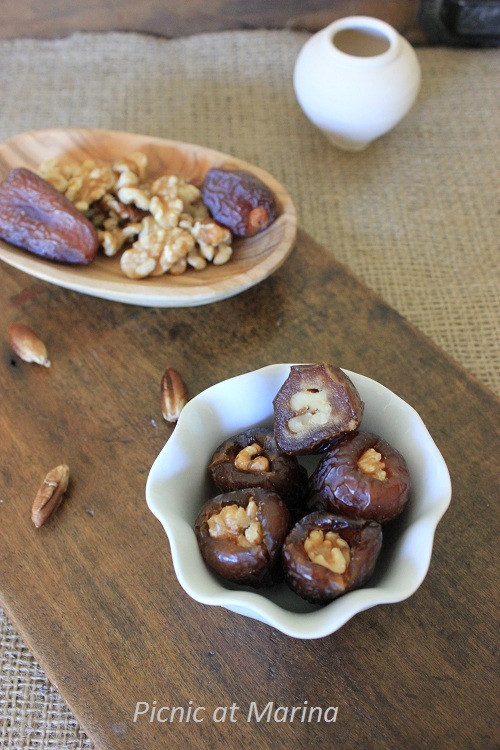 Have you ever tried it with medjool dates? Ahaha, oh dear - this sounds like the exact sort of thing my father would have done, if I still lived at home :D They look lovely, although I've never really been able to get on board with dates. In paste form, like in pastries, they're absolutely great, but on their own I've never been a huge fan. I've never tried a fresh one - should try it sometime. Lovely stuffed dates. Such a sweet response :) Sometimes we forget what's important, but you did not. I haven't made stuffed dates for years. I love them, and yours look so delectable! Hi Valerie, I am fine with that. When I started my blog I decided for myself that my blog is going to be about our life, hence no special "effects", just a reflection of what we love, eat, see... :) Thanks for your kind comment! My husband knows better, not to touch before I photograph it first-)) It was fun reading about your little moments with your dear husband. That is soooo funny! If I saw a plate of those stuffed dates lying around, I'd eat it too! I have just picked up some walnuts in the garden this morning, now I know what to do with them. Oh dear me, I will learn from your experience and shall leave a note on something if I still want to photograph it. I too battle with finding the right light for photos. The stuffed dates look fantastic too. these are so tasty!! And they make a healthy snack too! Dear Marina, What a sweet story. These are a delicious treat. I used to get the task of stuffing the dates on holidays when I was a little girl. Haha, I can't even tell you how many times that happens to me. Or, I'll be eating dinner and realise.. OH NO, I forgot to photograph it before I messed it up with my enthusiastic nom, nom, nomming. My friend is the same way, she always asks if I want to take photo when we go out... :) Thanks for your comment, Sara! I wish my husband would eat more of the food that I prepare . . . such as recipes with dates or figs, etc. I'd be kissing him all over his face! Good story Marina, but these look even better than the story! 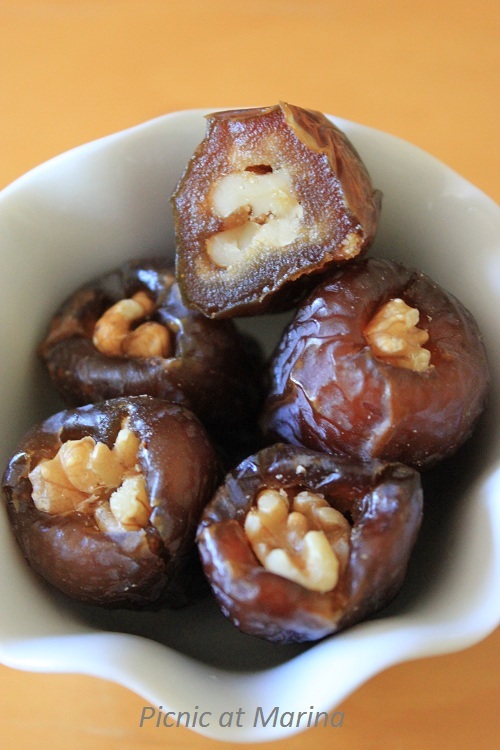 I love, love, love dates! these dates look yummy! i have also stuffed dates with blanched almonds and sometimes, i even roll them around in finely shredded coconut... they taste brilliant! Isn't it fun to read how everyone handles similar situation?! Thanks for your comment! :) Almonds and dates would taste really good! Haha. Such a lovely story and such tasty dates. Thank you so much for sharing...what a delicious way to end my weekend. I hope you have a beautiful Monday, my friend! sweet fun story. and yum...looks delicious!! These look delicious! I must remember to try making some for my kids. Oh well, I have so many stories reagarding photographing my plates, that you would crack up! It doesn't matter your photos look terrific and after all you made your husband happy with your dish so that's really important! Oh that happened to me one time too many! and I know what you mean about getting muscles moving furniture to chase sun light! I really enjoyed the "accidental" story. You are such a good wife. The dates looks beautiful in the photo. Great job photographing.